Masca valley Tenerife is a spectacular area in the western part of Tenerife, Canary islands. 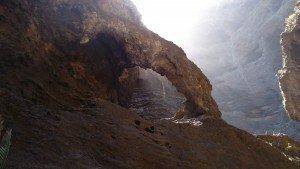 It is named after a tiny Masca village which is at around 600 meters above the sea level. 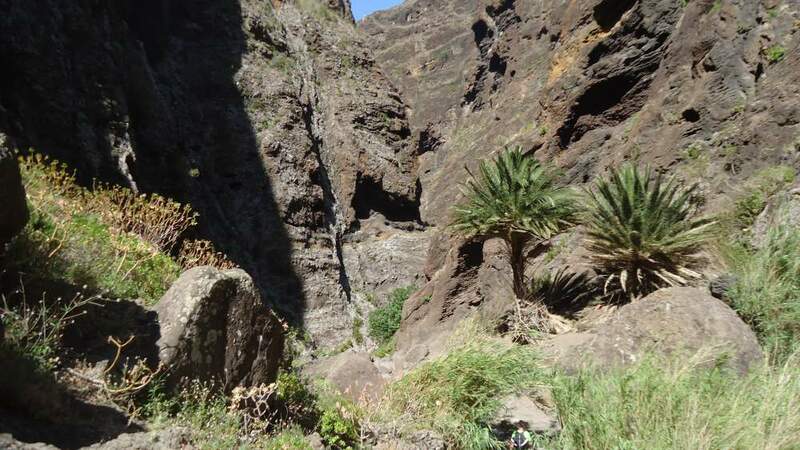 This is a popular touristic spot and many people take part in Masca walk, a 4.5 kilometers descent through Masca gorge, from the village to the sea. The majority of visitors perform the Masca walk in one direction only, by descending to the sea and then taking a boat to Los Gigantes. In May 2015, the boat ticket was 8 Euro. You may make payment online. When you get out of the gorge and continue walking toward the sea, first what you will see are two ‘offices’ waiting for you at each side of the path. These are just two small table desks and two people from two agencies who take care about boat-taxi. So you will check your registration there and receive the ticket. 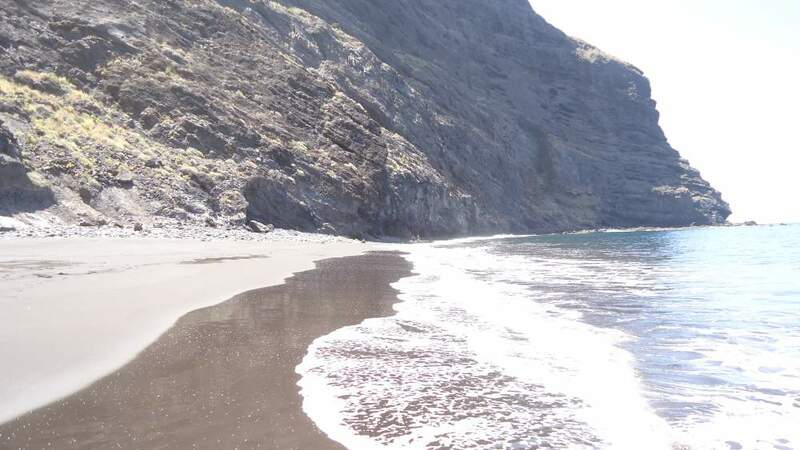 If you still have enough time before the boat comes, you will have a chance to enjoy the beautiful beach with black volcanic sand and perfect water of the Atlantic ocean, see the pictures below. Masca valley seen from the road to Santiago del Teide. Masca village, the start of the route. 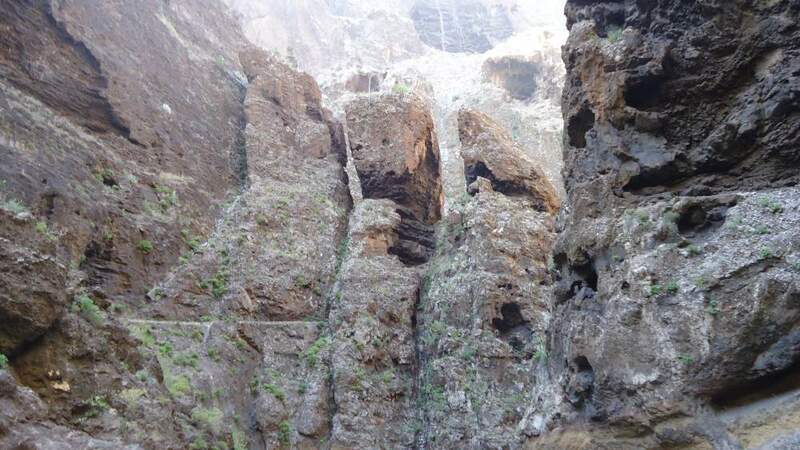 You may do it the other way around, by boat from Los Gigantes to the beginning of the Masca valley and then climb up through the gorge to Masca village. For this, you may arrange a taxi to wait for you at the upper end of the route. I have been told that the taxi service for this is around 10 Euro to/from Los Gigantes. 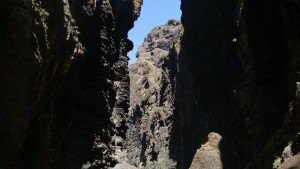 The descent is not easy, but it is much harder if you decide to do the Masca walk in both directions. This is 600 meters altitude difference. As for the timing in any of the two variants, well, it depends on your physical conditions; you may think about anything between 5 and 7 hours (and I mean in both directions). But it is doable in a much shorter time, see below in the text. The landscape is volcanic, vertical cliffs around at many places, sometimes hundreds of meters high. At one point you will see a great stone arch above you, and you will have short passages through at least one natural rock tunnel. You will be passing water streams a few times, so the path may be slippery at such places, and in the case of rain in general. 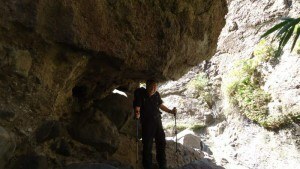 Have strong hiking shoes, you will need them for such a rough volcanic terrain. Having walking poles is an advantage. The first view of the Atlantic. The beach at the end of the route. Atlantic ocean, at the end of the tour. I did the Masca gorge walk together with my friend Mitsuo Kono. We descended from the village in 2 hours and 20 minutes. It was a bit chilly and windy, which was quite good in such an environment. It was a morning tour and most of the time we were in the shadow of the walls around. Mitsuo then took the boat to Los Gigantes and I went back the same way. As a kind of test, I pushed myself to the limits, so I was back in Masca in 1 hour and 45 minutes. 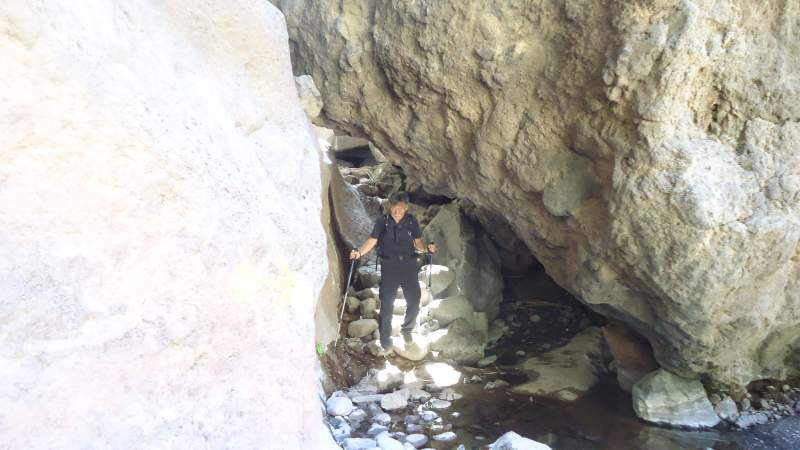 There were probably around 150 people in the gorge on the way back, sometimes in huge groups with guides. I was carrying 3 liters of water for both directions, and I used it all. Mitsuo at the beginning of the route. Mitsuo in a good mood under the rock. Mitsuo in a passage through the rock. Roads on Tenerife are generally good. Though this particular part of the island is not connected by the highway which goes around the bigger part of the island. 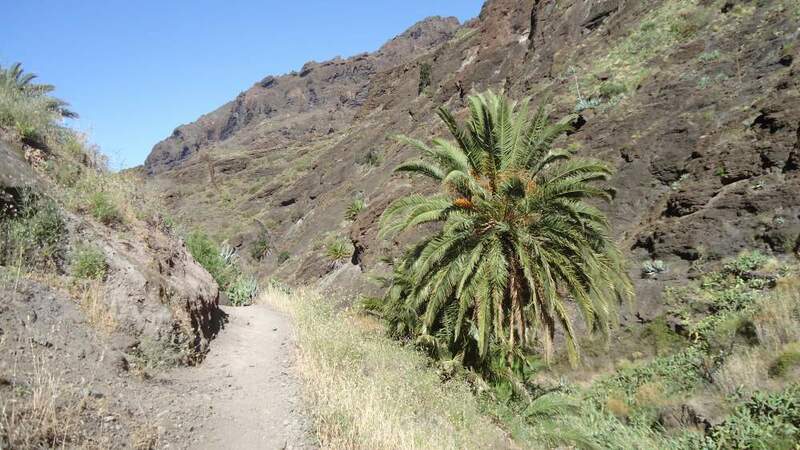 Masca is on the road from Buenavista to Santiago to Teide, but much better access is by the road from Icod de los Vinos to Santiago, or from the south direction to Santiago. 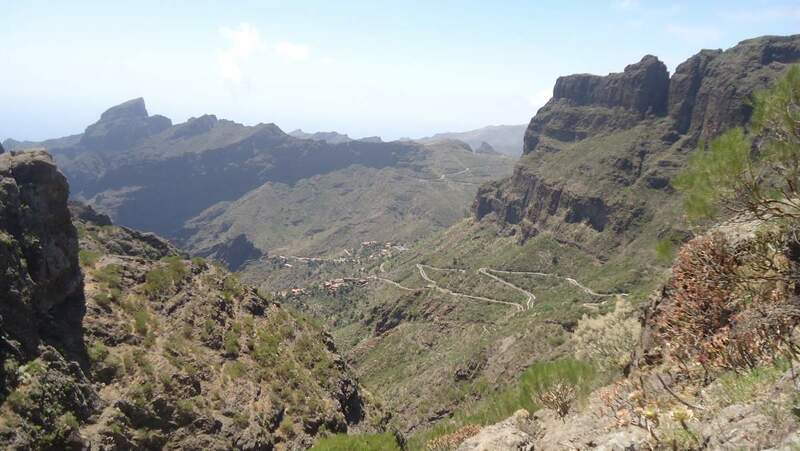 The part from Masca to Santiago is particularly attractive mountain road, with an excellent asphalt surface, but full of curves and you will have to be focused. Chamorga to faro de Anaga. Wow! It is so enjoyable journey with your videos, surely we will do the beautiful walk in September. One question: if we drive to Masca then walk down the valley to the ocean, what should we do with our car if we dont want to walk up the mountain? Where should we park our car? 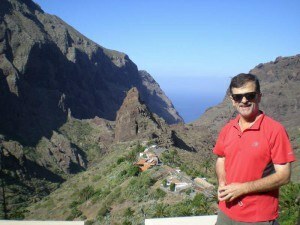 Hi, if you do not want to climb back, then you go to Los Gigantes by boat and pay a taxi back to Masca, it should be 10 – 15 Euro. 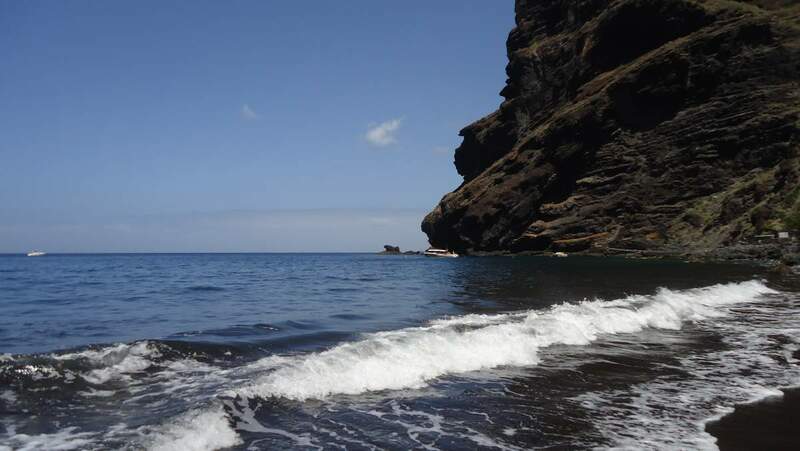 Or leave the car in Los Gigantes and take a taxi to Masca, walk down and get back by boat. Found it quite difficult to find a proper description of the hike on the net – but this is just awesome precise! Thank! Thank you Denis, this is what I love to hear and this is why all my described tours are a first-hand experience. This is what you need when you set on the tour. Thank you Kasia. I am sure readers will appreciate this information. I did not pass the route. Why would you not add a text here if you have been there? I have an open invitation for the guest authors, please have a look and let me know. 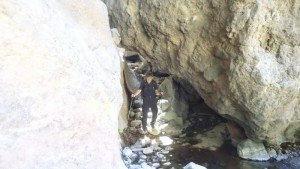 I just came across your site looking for ways to trek Guajara and also walking from Vilaflor to the Paisaje Lunar in Tenerife next month. Thanks to your great site I now know that I can do both routes on the same day, which simply means that I can fit another walk on my schedule… Hooray! I’ve read a few of your articles and having done some of the walks myself, I really feel your tips are extremely helpful. 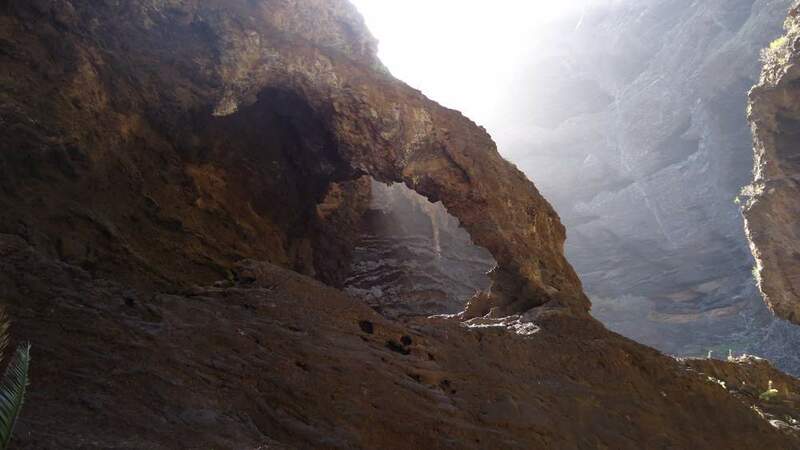 This year I’m thinking of doing Vilaflor to Guajara and El Barranco del Diablo as a short walk but would certainly love to do a longer hike in Anaga. I’m thinking Almaciga to Roque Bermejo but wanted to ask your opinion. Do you think it’s doable in a day (one way)? It is tempting but don’t want to be foolish! I hope you have a nice weekend and thank you in advance. Hi Fini, so great to read this. Man you touched me deeply with this story about 40 years. I had something similar recently in Slovenian Alps, in an area which I visited after 26 years. Well, Mitsuo vent by boat and I was rushing on purpose to test myself and also to avoid him waiting for me in the port too long. I was in a good shape, but not so in this moment unfortunately. But hey, I am going to the Alps soon, to get in shape. This tour from Vilafloor was exceptionally beautiful, but I suffered from altitude sickness which was really surprising. Plan a lot of time to enjoy it properly, this is the purpose. Anaga, man, this brings a lot memory back. Extraordinary place. As for Almaciga to Roque Bermejo, I realized I did not put this story on the site. So yes I have walked it, you can do several variants of it. Perhaps these days I might finally add a text. 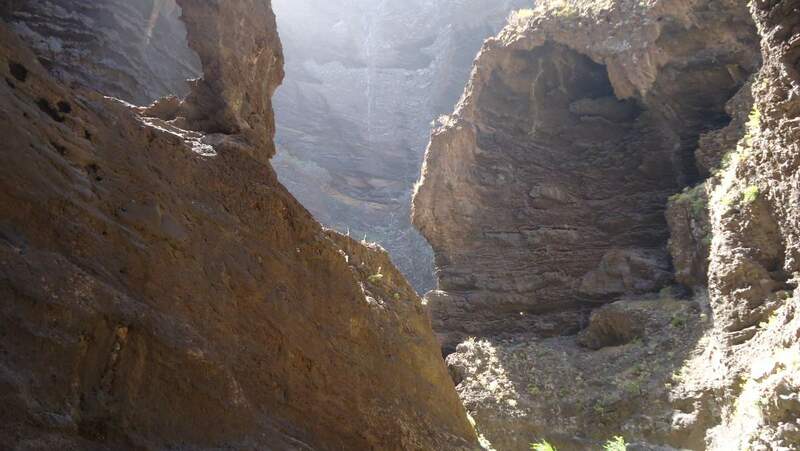 Yes it is easily doable, I did it with a Chinese friend, plan 3 hours for Almaciga to Roque Bermejo, this is rather easy, plus 70 – 75 minutes from Roque Bermejo to Chamorga, this part is climbing up all the time. From Chamorga you can catch a bus to Santa Cruz. Let me know if you need more info. Note, there is water to refill after you pass Roques the Anaga. Thanks a lot for your reply. I’m sorry to hear that you are not 100% at the moment. The Alps are magic too so I’m sure they will heal you. I actually went to the lower French Alps after Tenerife in 2015 and did some fabulous walks. Without a doubt, the best summer ever!! I’m glad you liked my story. There is something very especial about going back to places close to our hearts. And my older siblings don’t worry too much these days about their slightly younger sister. The Slovenian Alps sound like a great story too!! I will certainly take your recommendations on altitude into account. Altitude is a strange thing… it hit me at the very, very top of El Teide one day and strangely enough one evening a few days later while we were stargazing at the foot of it. The rest of the times, before and after, I was fine! So bizarre! I’ll carry on checking your site for tips. Have a great summer and I wish you a speedy, full recovery on the Alps. 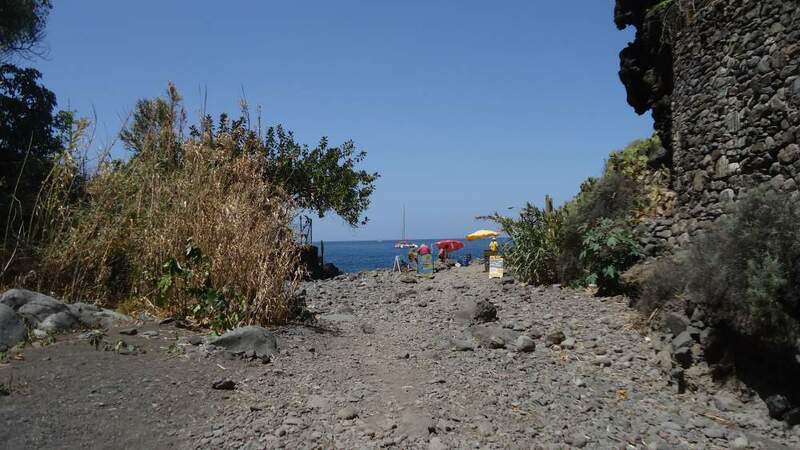 When you reach Bermejo point you cannot continue along the coast, no route and also the rest is a protected zone Ijuana. But you can go Chamorga-Cruz de Chamorga and then back to Benijo and Almaciga, or continue from Chamorga to the south all the way to Igueste de San Andres (this is very long, I did it both ways), or from Chamorga – Cruz de Chamorga along the Anaga ridge to Ensillada and wait for the Chamorga bus there. Wow you really know the island. Many thanks again. Hi Jovo, thank you for your reply. I wrote a reply back but did not seem to go through. Did you receive it or does the system not allow for it? Yes I am reading it both, many thanks Fini. 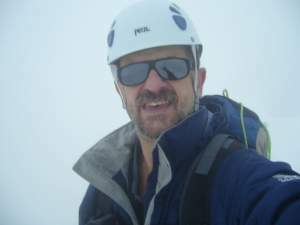 Hi Stuart, if I understand you are not there yet, so do not give up with Teide. 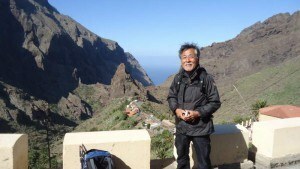 Certainly go to Masca, this is a great place to visit. 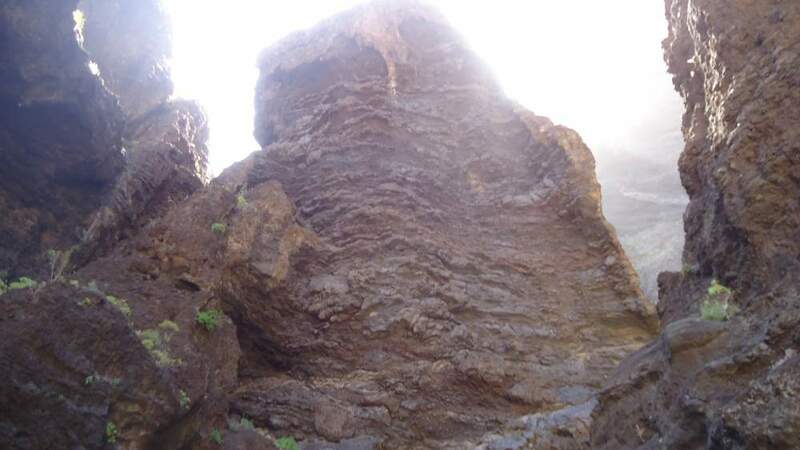 About Teide, permits must be done long in advance. But if you stay in the Altavista hut then the permit is included. So try to get to the hut. They are usually booked, but one never knows. Another option is climbing overnight and be on the summit before the guards come. They come with the first gondola. Yet another option is to be there when the guards go home (with the last gondola around 16:30). So you have plenty of time before sunset. Though you will need a torch for descending back to the road. Finally, even without permit you can still go to 3550 meters and walk around. Only the final part to the summit is with permit. I have described all these options in my texts. Hi Tad, thank you. Regarding camera, I use just an ordinary Sony pocket camera, do not want any heavy stuff. That view is absolutely stunning!! I have dreamed of going to Europe to visit the museums and probably catch a football game; but now I need to add the Masca Valley to my list of destinations. Hi Diana, thanks a lot. Masca is wonderful indeed so if you have a chance do not miss it. Do not worry about falling off, with just a bit if care all will be fine, hundreds of people pass the route daily. Although technically it is in Europe, the island Tenerife is in the Atlantic, Spanish territory. Oh, how I love to travel in my mind, and the internet makes it so much easier! Tenerife sounds and looks like an incredible adventure. I’ve always been a fan of hiking, and I love going to places that are a little less travelled, and not so touristy. The images you have here of the small villages, gorgeous mountains and lava formations, and what appears to be a very pleasant (although strenuous) hike through the mountainous areas really has me intrigued. I can’t wait to look through your website further and check out some of your other adventures. Great information, thanks. Hi Sarah, thank you for reading my text. Great to hear that you like it. If you ever have a chance to visit Masca do not miss it. Thanks for sharing. The scenery is breath-taking! makes me want to take a trip there. I love the outdoors and taking long walks in nature. I am hoping to take a nice holiday sometime in the next year. I’ll have a look at the accommodation links you shared. I see you mentioned taking water with, so I assume there is nowhere to get drinks of food along the way so you would have to take your own snacks and food? Hi Lynne, thanks for the comment. Regarding the food and drink, you start from the village so you can get supplies there. This is not a whole-day tour so you might not need food, but certainly bring water with you. Take care. 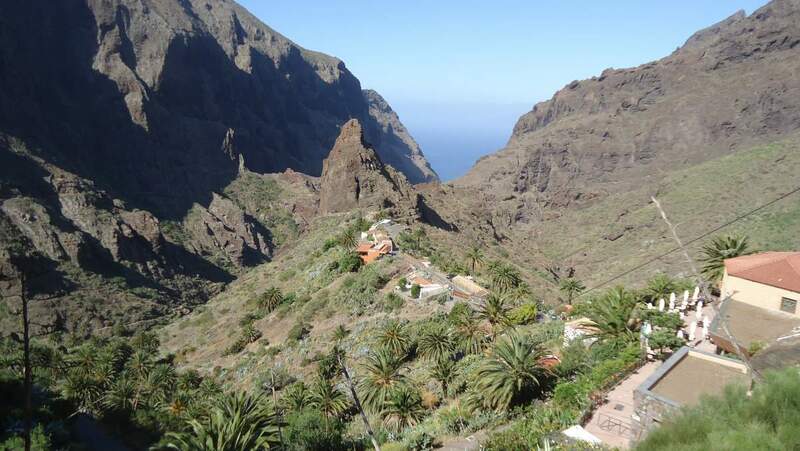 What a beautiful place Masca Valley Tenerify is. This is a well written post with a lot of great information about Masca, and some fantastic images. I love hiking and maybe I hope to be able to hike the Masca Valley one day. Be looking forward to more of your post. Hi David, thank you for the comment. 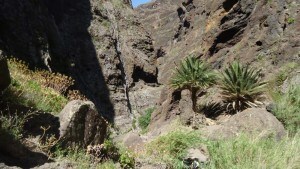 I am glad that you like my text about Masca valley on Tenerife island. These pictures are breathtaking. Love your site! Many thanks Jim, great to have your comment. I enjoy seeing Masca Valley Tenerify. It is a beautiful site. Thanks for showing the high quality images and videos. It’s like I am there with you guys. If I have to join, what should I prepare? 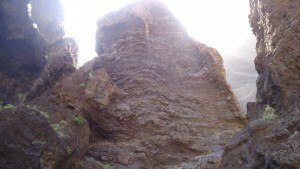 Very nice photos of the Masca Valley. Do you have the possibility to do the climb as part of a group with a guide? And if, so what is the average group size? Very nice photos and videos of some places that look like would be great to visit on a vacation!